AMOSUP Seamen’s Hospital continues to carry on its upgrading process, with the acquisition of more sets of medical equipment to provide the best available quality healthcare to union members and their dependents. Apart from the newly acquired 160-slice CT multiple scan machine launched last October, a brand new cutting instrument, the Harmonic Scalpel EES generator, has been provided to each of the union’s hospitals in Manila, Cebu, Iloilo and Davao. The medical instrument is used during surgical procedures to simultaneously cut and coagulate tissue, in which the scalpel surface itself cuts through tissue. The harmonic scalpel is regarded as a surgeon’s “mechanical assistant” because of its capability, making the surgeon’s life easier as well, as it lessens the time spent in a surgical procedure. As new imaging machines were purchased and installed in the Manila hospital, its Radiology Department disposed of its analog x-ray machine by installing two new Toshiba digital radiography systems. Using an x-ray analog type, a chest x-ray procedure takes about seven to10 minutes. But with the digital system, only a minute or two is spent for the whole process, thereby increasing the volume of patients the department can accommodate in the given time. A total make-over was also done in the department since the reception area becomes wider and the old vinyl flooring has been replaced by granite tiles. 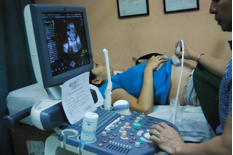 Likewise, Seamen’s Hospital Manila acquired its ultrasound equipment for pregnant wives or mothers of union members. The Voluson P8 Extra Vision GE ultrasound possesses 3D multiple displays and an option for real time 4Dimensional view. The machine is capable of system overview applications for studies such as in obstetrics, gynecology, abdominal, small parts, vascular, pediatrics, cardiology, urology, and musko-skeletal. Furthermore, three new Doppler machines were purchased in the department to better aid obstetrician in monitoring the fetal heart rate during pre-natal care and spot delivery. In the Cardiovascular Department of Surgery, the hospital now offers carotid carotid duplex scan and peripheral arterial and venous duplex studies. Patients need not go to outside facilities for these procedures and pay from their own pocket. It is now being offered in Seamen’s Hospital Manila. On the other hand, the Urology Section will soon have its brand new Sonolith i-move ESWL machine, which is used in pulverizing kidney stones so that these will be excreted from the system thru urination. This is also one of the most utilised services in the hospital as many of the patients, especially for seafarers undergoing pre-employment medical examination requiring removal of kidney stones. Mariners prefer this procedure because they can go home right after the procedure and the recuperation period is shorter compared with an open surgery. Dr. George C. Pile, a long-time specialist physician at the AMOSUP Seamen’s Hospital, has been appointed as its new medical director. AMOSUP president Dr. Conrado F. Oca made the announcement during the commemoration of the Hospital’s 27th founding anniversary last 23rd February. Prior to his appointment, Dr. Pile chaired the ENT Department of Seamen’s Hospital, where he began to treat seafarers and their dependents since February 2001. As an active physician in his field of expertise, he is a current Diplomate of the Philippine Board of Opthalmology. Dr. Pile graduated from the University of the East College of Medicine (UERMMC) in 1991 and took his residency training at St. Lukes Medical on E. Rodriguez Avenue, where he finished training in 1998. Since then Dr. Pile’s reputation as a physician grew and now also holds affiliations at Fatima Medical Center, St. Lukes Medical Center, and the Asian Hospital and Medical Center.